The most famous contrade in Italy are in Siena where their 17 contrade race horses in the Palio di Siena. In Montepulciano, the eight contrade would race the horses up the 11.5 kilometers (7.5 miles) road from the bottom of Montepulciano to the top. While the horse racing ended in the 14th century, since 1974 teams of two from each contrade roll wine barrels approximately 1.6 kilometers up the hill to the Duomo in the Piazza Grande. While this race takes place each year on the last Sunday in August, the week leading up to this date is also filled with other activities. The city streets are adorned with flags of the various contrade. Nights are filled with parties. 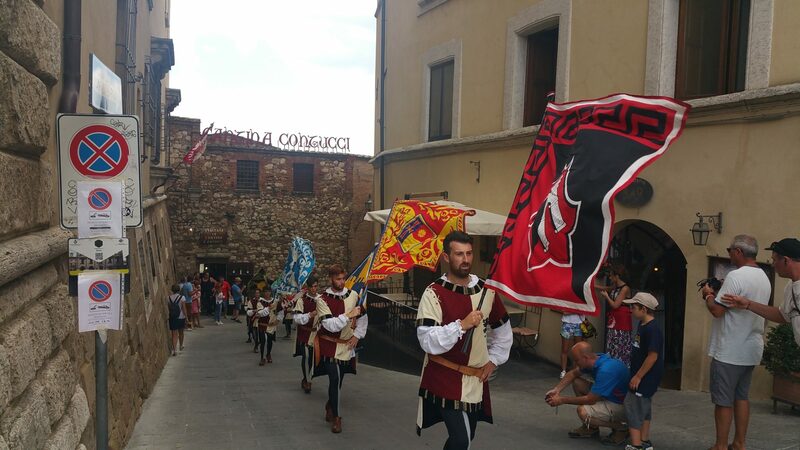 Flag bearers, drummers and others from each contrade dress in their medieval costumes in their colors and march in the Corteo Storico, an historical parade through town. And for the entire week leading up to the barrel race, each contrade sets up a pop-up restaurant in their district. The menus, prepared by non-professionals who live in the districts, vary each night. Locals and tourists alike dine at these restaurants, and the districts raise money to pay for new costumes, flags and drums. 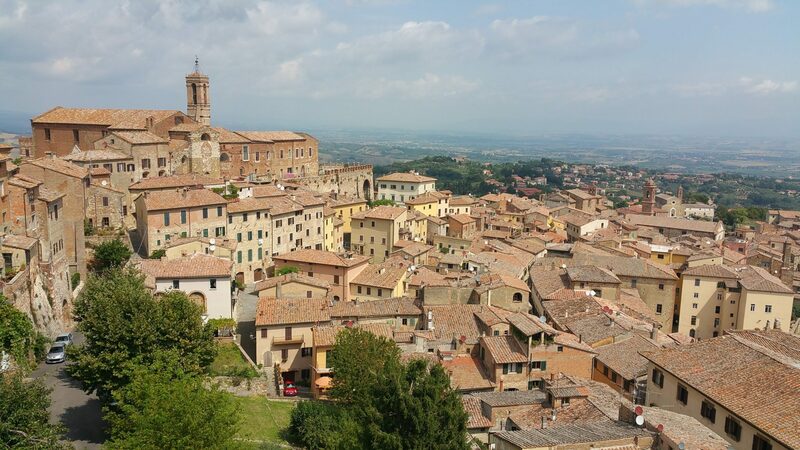 But Montepulciano is more than its medieval history. It is home to Vino Nobile di Montepulciano, the first DOC (Denominazione di origine controllata, a quality assurance label for Italian food products) wine in Italy, and arguably the first DOCG (Denominazione di Origine Controllata e Garantita, which follows the strictest controls) wine in Italy. Vino Nobile di Montepulciano is made with a minimum of 70 percent sangiovese and up to 30 percent of approved grapes (canaiolo nero, mammolo, colorino, cabernet sauvignon, merlot). It is a full-bodied wine with soft, round tannins. It is a wine to pair with food. That is why famous Italian food journalist and television and radio host Bruno Gambacorto created A Tavola con il Vino 14 years ago. 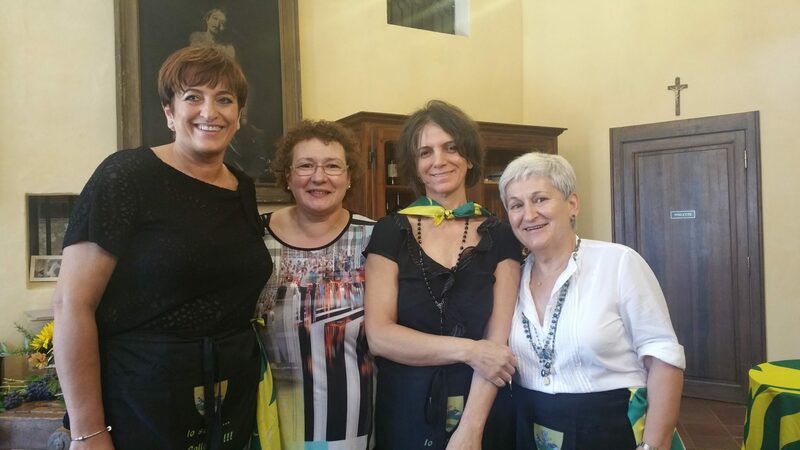 Each year, a theme is determined and the contrade need to prepare a dish that will be incorporated in one course served during the week of their pop-up restaurant. Past themes have included Cinta Senese, a dark pig with a white belt from the area, and vegetables. 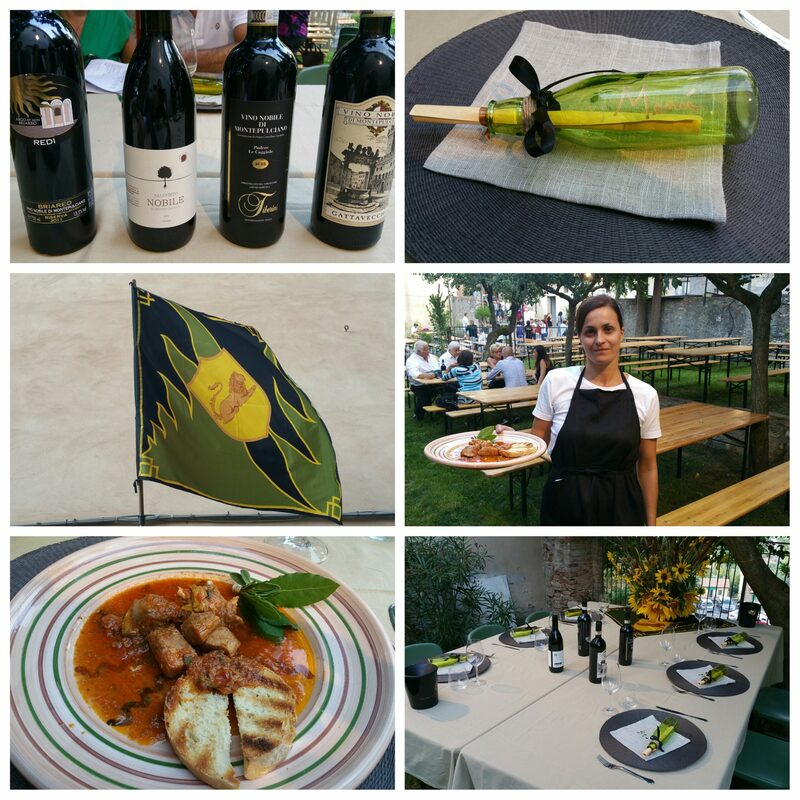 This year, the theme was “wild animals,” which in Montepulciano includes pheasant, quail, wild boar and deer. 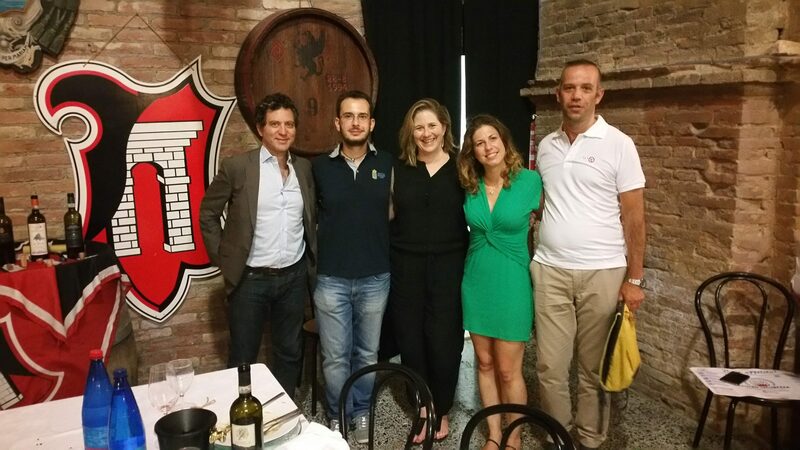 Journalists from throughout Italy, as well as four of us from America, made up the judges. There were four teams of five people each. Our job was to stop at each contrade and try their dish featuring a wild animal. The dish must be inspired by local tradition, emphasizing local produce and, most importantly, pair well with Vino Nobile di Montepulciano. It was our job to select one wine out of four at each pop-up that best paired with the dish. The winner: Quaglia Fruttata (Fruit Flavored Quails) by Contrata Collazzi. 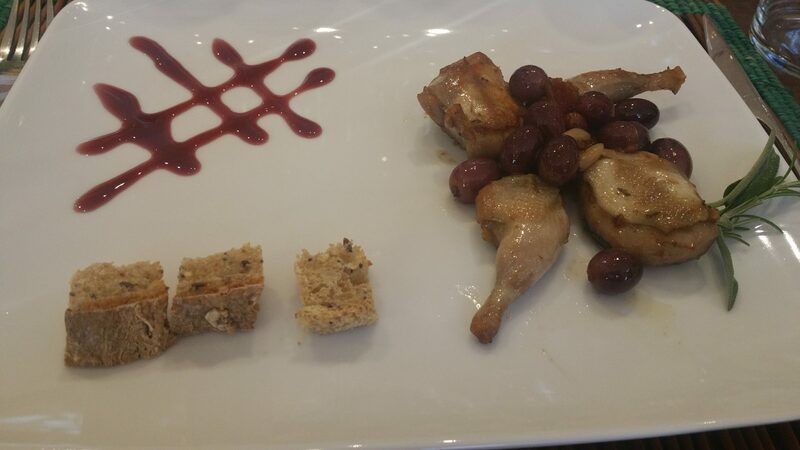 This quail dish was made with local pine nuts, red grapes, scosciamonaca plums, juniperberries, Cinta Senese pork cheek lard, shallot, rosemary, sage, white wine, Cognac and extra virgin olive oil. While all of the dishes were well thought out, featured local ingredients and were tasty, this one was a clear winner. And the wine that it paired best with, from the 17 we tasted, was the Gattavecchi 2013 Vino Nobile di Montepulciano. A deep garnet color, the wine has notes of plum and robust tannins that matched well with the sweetness from the fruit in the dish. There was a lot of tasting during the two-day A Tavola con il Nobile food and wine competition, but thankfully there was also a lot of wandering up and down the hill of Montepulciano. This entry was posted in Food, Lifestyle, Travel, Wine and tagged A Tavola con il Vino, food, food and wine pairing, Gattavecchi 2013 Vino Nobile di Montepulciano, Italy, Montepulciano, Napa Valley Register, sangiovese, Travel, Tuscany, Vino Nobile, Vino Nobile di Montepulciano, Wine by Allison Levine. Wonderful article! Makes me want to go right now!